Our local middle school put on Willy Wonka Jr. for their musical this year. 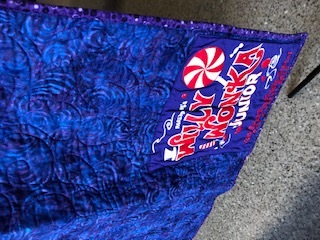 I used the Spectacle quilt pattern to make a Willy Wonka inspired quilt. 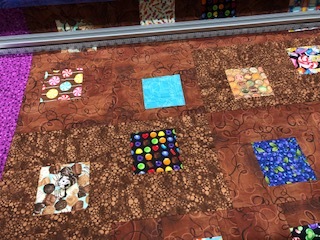 The center of the squares all had a relationship to the show – chocolate, candy, blueberries, gum, soda, TV, etc. 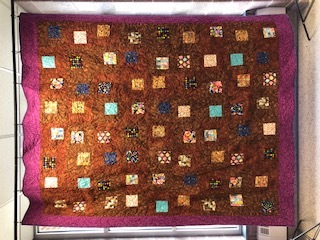 The outsides of the squares were made up of two different types of brown fabric to represent chocolate. The border, back & binding were all different shades of purple. 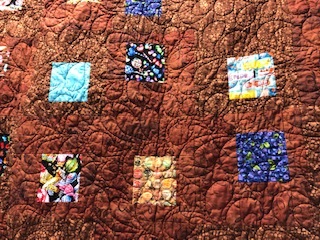 I even sewed on a show shirt to the back of the quilt. 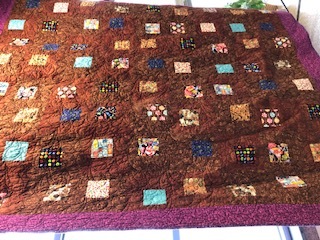 This full size quilt was raffled off and raised over $200 for next year’s musical budget.